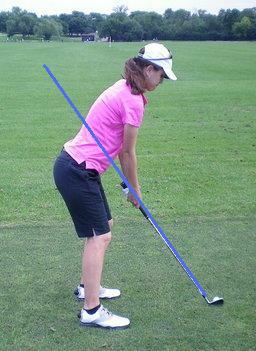 The swing plane is an important part of the golf swing to have correct. Swinging the club too far off plane can cause errant golf shots. You can generate more power and accuracy by keeping the club on the proper path throughout the swing. In the picture above, there is the line of the golf swing plane. This is the line I want to take my golf club back on in the backswing. As I turn and finish my backswing, the club will swing slightly above the plane line. As I swing the club back down on the downswing, I want the club to stay on the same swing plane from the backswing. The important thing with the swing plane is to get the golf club swinging up and down along the same line near impact with the golf ball. You want to have the club swing back down the same line as you hit the ball. This is what will allow you to hit more solid and consistent golf shots. Standing up or coming out of your shot will cause your club to get off plane. Extra or incorrect body motions can throw your golf club off plane as well. Content Copyright 2010-2018. Sarah Pesavento Golf.